Paris -- Of the thousands of people witnessing the “yellow vest” protests in Paris over the past few weeks, three young men have had a decidedly different perspective. They are Syrians who have seen friends and loved ones die and their hometowns reduced to rubble. Having escaped war, they are now covering violence in a European capital. With a smile. The “yellow vest” protests have gone on for four straight weekends and have been some of the worst rioting France has seen in decades, with hundreds arrested, millions of euros in damage and four people dead. The police have fired tear gas, water cannon and stun grenades. 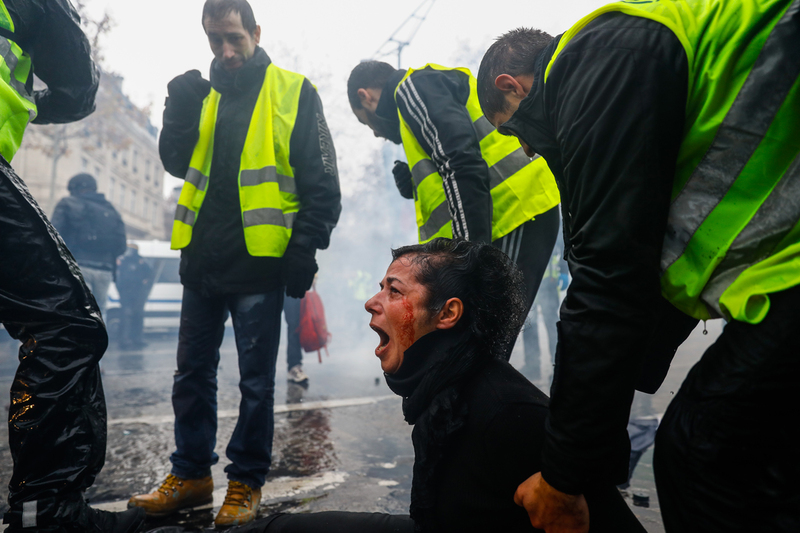 The worst damage has come over the past two weekends, when vandals and trouble makers joined the original “yellow vest” demonstrators protesting against declining living standards. Abdulmonam Eassa -- When I thought of my new life in France I pictured a calm existence, rebuilding my life as I learned a new language, made new friends and enjoyed living in a country at peace. I didn’t think I’d be having flashbacks of military strikes on the Champs Elysees. I’m a photographer and had documented Syria’s descent into hell for seven years. The last two months in my hometown Ghouta were particularly harrowing. I’ve watched friends die, heard the animal cries of parents seeing their children in a morgue, have run through the streets carrying a wailing toddler whose mother had just been killed in an air strike, his broken ankle dangling. I’ve known hunger, fear and that numbness that comes from complete physical and emotional exhaustion. Eventually I escaped and made my way to Paris. I am learning the language, discovering the city and getting used to living without fearing an airstrike on my home. And I keep taking pictures, because I am a photographer and it is what I love to do. Sameer Al-Doumy -- The first time I got a whiff of tear gas, I got a warm, nice feeling all over. The last time I smelled it was almost eight years ago, when the Syrian uprising started. They say that smells unleash powerful memories and I immediately started remembering those demonstrations. Back then, the demonstrations were peaceful, just Syrians who wanted more freedom after years of dictatorship. Back then, police just fired tear gas at us. There were no live bullets, mortar shells, airstrikes. Back then many friends and loved ones were still alive. Back then our cities weren’t bombed to rubble and living conditions were good. In hindsight, they were the beautiful days. And that first whiff of tear gas took me back to all that. As I worked the demonstrations, I couldn’t help but compare what I was seeing to our situation. The most striking thing is the police. I realize that for French people, this is a lot of violence. Tear gas, stun grenades, non-lethal weapons for crowd control. Hundreds of people arrested. But to us, for the most part, the interactions with police are night and day. I mean, they will actually let you into the protest zone if you have a camera! I walked up and said in my broken French that I was a journalist, showed my ID. The cop asked me for the official media card. But I don’t have one yet. So I googled myself on my phone and showed him the pictures that I’ve taken. He was shocked by them, and he let me in right away. In Syria, if you have a camera, you’ll be kidnapped by the police. You stay as far away from them as possible. Abdulmonam -- I have to say that I was shocked by the level of violence that I saw on the part of some of the demonstrators. The ones who were burning cars and breaking store windows. I didn’t expect this level of violence. I thought people are civil here and they would demonstrate politely. I never thought there would be these clashes. I thought the police would just stand around, looking at the people. I didn’t expect to be choking on tear gas. The first weekend they used it, I didn’t bring anything to protect myself. I had the same scarf I was wearing the last weeks in Syria. Never in my life did I imagine that I’d see such a thing in Paris. In this picture, a blast came out of a car on fire. This guy is covering his face because a car exploded. Of course, you can’t compare it with what I’ve seen in Syria. But I just never thought I’d be covering explosions in downtown Paris. At one point, the police used a stun grenade and a helicopter flew above and a police used a whistle that sounded a bit like a missile landing. That’s when I got a flashback to Syria. Just for a moment. What’s going on here, I thought. But even with all that violence, no-one died. In Syria, the demonstrations at the start of the uprising were totally peaceful. And so many people died. In Syria you had peaceful demonstrations and people died. Here, you have violent demonstrations and no-one died. Sameer -- When we Syrians first started demonstrating, we were just calling for freedom, justice, equality. In the beginning, it wasn’t even for the regime to be taken down. And they started killing us right away. If we did what the French people did here, they probably would have used chemical weapons on us right away. I heard a guy shout during the protest: “This is war!.” I chuckled when I heard that. You can imagine what that sounded like to me. This isn’t war, man. I realize it’s more violence than you’re used to. But it’s not war. It’s not even close. Abdulmonam -- Just the way the protesters were behaving spoke volumes about the differences between the two countries. 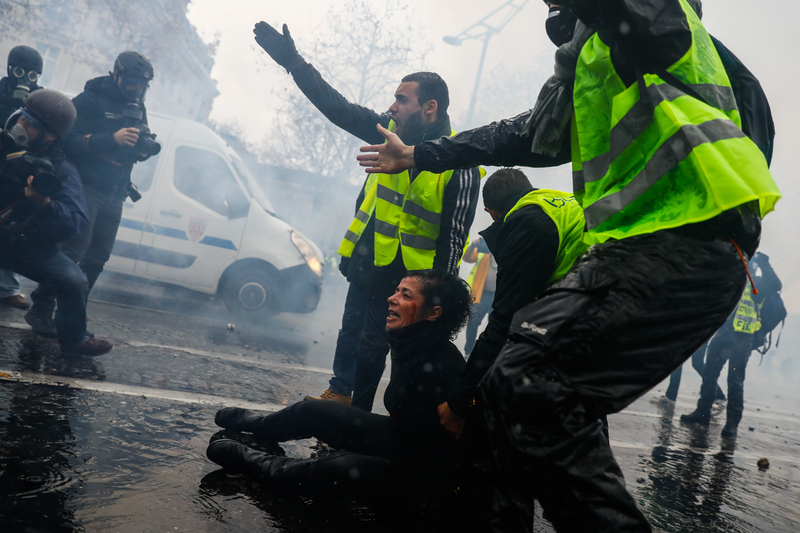 In Paris, once the police charged the crowds, the protesters would run away from one area, regroup and go demonstrate or cause trouble in another. They didn’t feel the need to escape. No-one was going to come and shoot them. I took a photo of a protester being dragged away by police. There was an altercation between the police and protesters. A policeman ran up and hit this guy with a baton and then his colleagues started dragging him away. But then five protesters came and dragged him away from the police. To come and rescue someone like that from arrest, that would just never happened in Syria. Once the police come, you run away because if they catch you, you’re killed. In Syria, demonstrations don’t just end with tear gas and arrests. They end in death and disappearance. I don’t know through experience, but I assume that being arrested in France is nothing like being arrested in Syria. Here, they know that no-one is going to shoot them and if they get arrested, they won’t die in custody. Sameer -- I was amazed that you can easily move between both sides here. You can take pictures with the demonstrators and then go to the police side. In Syria, you can’t be close to the police. They don’t want you taking pictures of anything, so they’ll just arrest you. And you’ll disappear. Everyone knows that. So whoever takes pictures from the police side in Syria is assumed to be a spy for them. Here, police film people as well. But nobody accused journalists like us of being spies for the authorities. Zakaria Abdelkafi -- In Syria, you can never have photos of demonstrators and police together. Here, you have plenty of photos of demonstrators talking to, or yelling at police. This would never happen in Syria. You don’t approach the police if you’re a demonstrator. That’s just not done. I’ve been living here for three years, so I know that even with these demonstrations nothing will happen here like in Syria. There is space for freedom of expression here. I wish Syria could be like that. Even if they don’t really listen to the people, but just so people could have a chance to come out and say what they want and for the government to hear it. If Syria was like that, there wouldn’t be a war and the country wouldn’t be destroyed. Abdulmonam -- Seeing the demonstrations here, I think I’ve realized that wherever you go in the world, people are the same. You have people who will come out in the streets for demanding an improvement in their life. And others won’t. They are satisfied with their lives. In Syria not everyone was demonstrating when protests first started in March 2011. And here too. I saw this one guy, he was on a bike last weekend. He was right in the middle of all the clashes. Things were burning around him. He stopped, took a look around and then went on with his daily life. Abdulmonam -- The thing that struck me during the latest protests were the police in civilian clothes. We had these guys in Syria, they’re called “shabiha.” The French ones were even dressed much like the “shabiha” back home. During the latest weekend, they would often sneak in between protesters, grab one and drag him away. They were just hitting everyone. Sameer -- There was one woman, she was on her knees, with her hands raised in front of a water cannon. 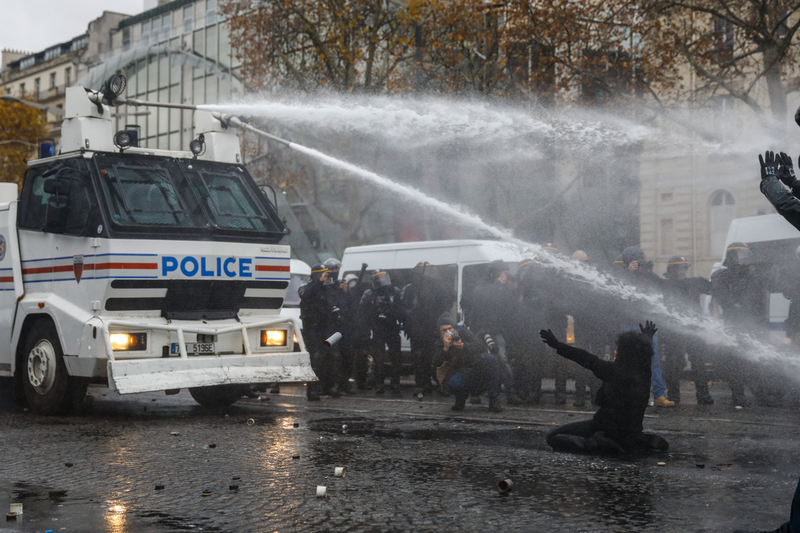 The police opened the water cannon on her and threw tear gas around her. She was injured. People rushed to her, trying to take her away. But she refused. I didn’t expect to see that. She was obviously peaceful, she didn’t have a weapon, why use so much violence? Zakaria --The photo of a stun grenade in one of the policeman’s hands is terrifying to me. Because I just don’t think that it’s acceptable for police to use such things against demonstrators. It doesn’t matter if there is violence, police shouldn’t use this type of violent weapon against demonstrators. I’ve watched friends die at demonstrations because police used weapons that look like this. One friend, a fellow journalist, died just a few meters from me. Look at it, just the shape of it is terrifying. I love the photo that I took of a police woman. She saw me and smiled when I was taking the photo, you can tell by her eyes. To me, it was one of the things that just summarized these protests. She allowed me to take this photo and helped by smiling. This would be unthinkable in Syria. A photo that I took of one guy being detained makes me ill. All I can think when I look at it is how my brother was detained. I was away from the house at the time. The plain-clothes police -- just like the ones in the Paris photo -- came looking for me. I was a journalist taking pictures and videos of the protests and they wanted to arrest me. My older brother told them that I wasn't there. They asked to see his ID and when they saw that he was my brother, they took him away. That was in 2012. We haven’t had word since. We don’t know if he is alive or dead. He was married with a child. Abdulmonam -- Friends back home have seen my photos and other coverage of “yellow vest” protests and they kid me -- “wherever you go, trouble follows.” After living for so many years near death, my friends and I have a very easy spirit. We joke around a lot. Sometimes they worry that France will end up down the same road as Syria. After all, the war at home started with peaceful protests. I try to explain to them the differences. A handful of people have died outside of Paris. But there have been no massive deaths. Plus, people just protest during the weekend. During the rest of the week, nothing happens. That part is very civilized. Sameer -- One major difference with the Syrian situation is the fact that the demonstrations lasted all day long and into the night. When the Syrian demonstrations started, we had to plan in advance. We’d settle on a place, come demonstrate for five, ten, fifteen minutes and then disperse before the police came and arrested us. Here, it’s like open bar, everyone can come and the party lasts for hours. When the “yellow vest” demonstrations first started, that’s what I used to say, that I was going to the party. Abdulmonam -- Some friends jokingly tell me, be careful, don’t get killed over there in France. I tell them -- are you kidding? It’s totally different here. We finish covering a protest and then go to a cafe to have a drink. Zakaria -- These two were still in Syria when I was already here. So I was seeing their photographs, knew what they were going through. I never thought we’d be working together on the Champs Elysees as part of one team. Abdulmonam -- There were more than a few times when people looked at us strangely because we were laughing. They must have thought we were crazy because we were laughing and enjoying ourselves so much. Once, I stopped to send some photos to the desk. And police threw three stun grenades, one was just a few meters to my side, another behind me. I just looked at them and burst out laughing. You have to understand. We witnessed a lot of horrible things. Our friends have died, often right in front of us. Our loved ones have disappeared. We have seen so much pain, so much grief. 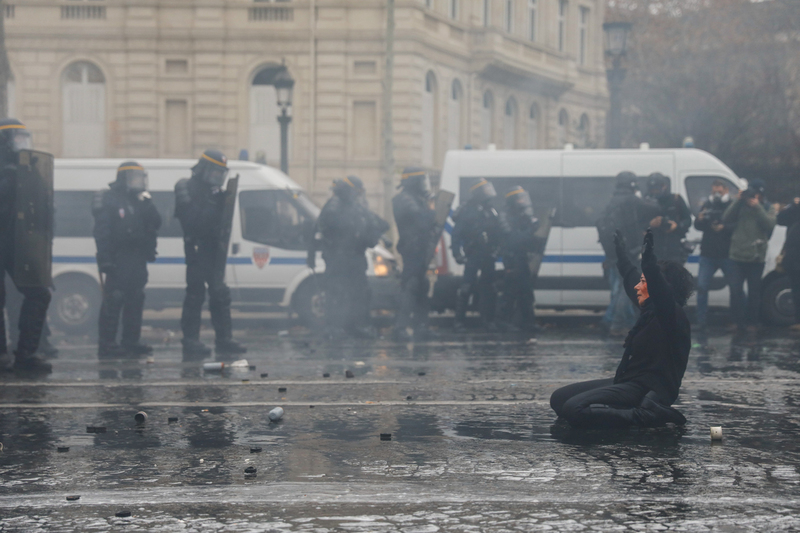 So to us a demonstration in Paris, even if people are burning cars, even if there is tear gas, it’s not dangerous. Because we knew that whatever happened, we wouldn’t die. We might get hit by a rubber bullet, we might inhale too much tear gas, we might get hit by the so-called “flash-balls,” the non-lethal weapons French police use in riot situations. But we wouldn’t die. We wouldn’t disappear. And we were working as a team. In Syria, we were on our own most of the time. Here, we were together, the three of us, with the other AFP photographers. Having been lucky enough to survive the war in Syria, this was fun. For us, it was a lot of fun. Photographer based in Paris, formerly Syria. Winner of 2016 World Press Photo award for his coverage of the war in Syria.